It was time to travel to French Polynesia – a moment I’d been waiting months and months for. And by ‘months and months’ I really mean ‘my entire life’. Anyway… after splashing my face with cold water while simultaneously ignoring the glaring stare from my cat Oscar (he knew something was up – he hates when we go away), I was awake. Scott and I then ventured into the main house, and were greeted by his parents. I laughed at his dad John, dressed in his work clothes, and teased that I wasn’t going to have to go to work for two weeks. Laughing, John gave me a hug and wished us a good time. He’s much nicer than me. I then said my hardest goodbye – to Keiko – whose tail was wagging furiously with excitement at all the people up and awake at such an early hour. I smothered her in kisses as I hugged her tightly, whispering into her ear that she’d be the only one that I’d miss (sorry, Oscar). Then, it was time to go. As we drove up Mount Ousley, the sun was beginning to rise, and we were treated to a spectacular display of colour over the city of Wollongong en route to the airport. Varying shades of pink, orange and yellow lit up the entire sky over the ocean, and the colours continued to glow until we reached Sydney. We arrived at the airport three hours early, said goodbye to Scott’s mum Karen, who so kindly drove us there (thanks Kaz), and despite recent security tightening, we breezed through check in with plenty of time to spare. It was now 8:00am – time for coffee. Our caffeine fix was granted by Joe and the Juice, and I’m not sure if it was the early morning, or the excitement of travel, or it was just bloody good coffee, but my soy latte from their branch at the International Terminal in Sydney was probably the best coffee I have ever had in my life. Seriously. After an overpriced yet rather tasty airport breakfast, we headed to our gate to find that our flight was delayed. This made me slightly anxious, not only because I am a little bit of a control freak, but also because we only had an hour and a half layover in Auckland before continuing on to Tahiti. Once I reminded myself that there was nothing I could do, I relaxed a bit…. kind of. Not long after we took off (about an hour behind schedule), an older woman in the row across from us was unwell. The crew did a fantastic job of looking after her, and she seemed to be okay. Once we landed, however, we had to wait for medical personnel to board the plane to check on her before anyone could disembark, which took about twenty minutes. This was when we really started to freak out, since our international flight to Tahiti was due to take off in less than an hour and we hadn’t been checked in yet. Luckily, the Qantas crew grabbed our passports, and ran across the airport to check us into the flight while we were stuck on the plane. Once we finally got off (the woman was totally fine, by the way), we were rushed through to our gate and made it just in time for our connecting flight – phew! We didn’t make it to bed until about 3:00am after landing in Papeete, so when my alarm went off at 6:45am it was immediately snoozed. Several times. Okay, it was snoozed for almost two hours. We were exhausted, and after fifteen hours of travel (time travel, if we’re being technical), we just couldn’t get out of bed. The bright, Tahitian sunshine that flooded our room, however, helped bring us back to life. It was time to drive down to Teahupo’o, about an hour and a half south of Papeete, where the 2017 Billabong Pro Tahiti was being held. 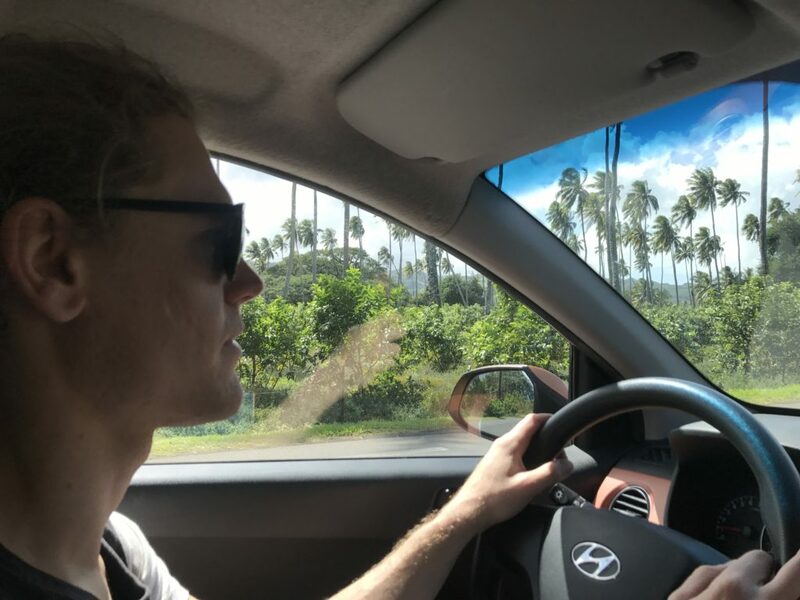 We excitedly took to the road, before realizing quickly that in French Polynesia, they drive on the other side of the road. Scotty driving on the right (wrong) side of the road. Luckily, Scott was behind the wheel, not me, so that made the journey a little safer, even though he managed to travel at least a few minutes on the wrong side, realising only when another car appeared in the distance directly ahead of us. Just short of yelling obscenities out the window, Scott quietly merged into the right lane and we started laughing hysterically. Hey, we were very sleep deprived! The drive down to Teahupo’o was stunning; the Pacific Ocean was a strikingly turquoise blue, and the recent rainfall had ensured that the island was covered in a brilliant display of green in just about every direction. The mountains peaked high into the sky, with clouds hovering just above the tip, looking both ominous and incredible at the same time. We finally made it to Vanira Lodge, our home for the next couple of days, at around lunchtime. 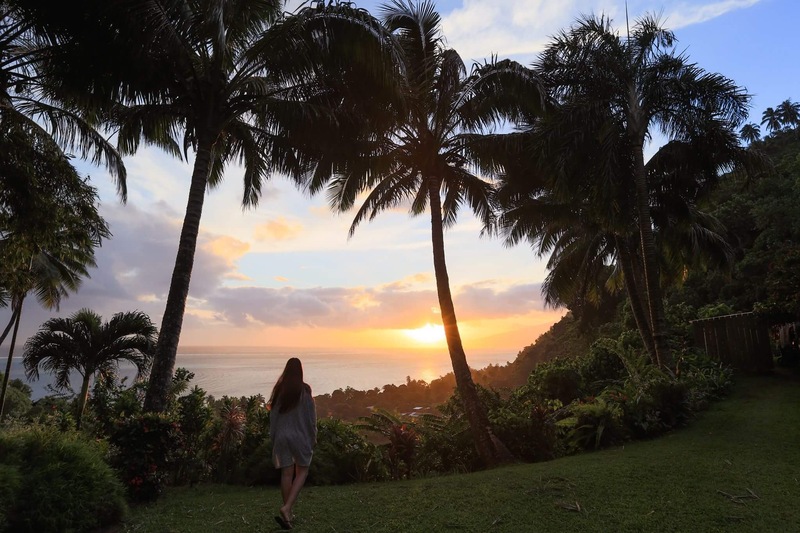 We checked in, quickly fell in love with the gorgeous little mountainside hotel, then made our way to ‘The End of the Road’, home of the famous Teahupo’o. As we ate our lunch from a shack on the black sand beach, we watched in awe at the kids surfing near the shore. The waves weren’t as large as the ones further out, but they weren’t exactly small either. It was pretty cool watching the future generation of local surfers learning to ride the waves, and perfecting their turns! It was too late to head out on a boat to watch the Billabong Pro Tahiti comp from the channel, so we made plans to head out the following morning and decided to head back to our bungalow for a nap, because we were bloody tired. We were probably only a minute or two from our turn off when we saw a few hitchhikers on the side of the road, thumbs out in earnest. What the hell, right? Our new friends consisted of a dad and daughter duo from England, and the daughter’s partner, who was American. They’d missed the bus heading back to Papeete, and needed a ride to the bus interchange about twenty minutes up the road. Always in need of extra good karma, we happily drove them there, swapping travel stories along the way. When we returned to Vanira Lodge, there was not one, but TWO dogs waiting for us to pet them – an instant return on our good deed! Barely able to keep our eyes open at this point, we hopped into bed with a book each, but only managed a few pages before we were knocked out for good. The 4 or so hours sleep the previous night was really taking its toll, and we snoozed until the late afternoon sunshine woke us a couple of hours later. A light tropical rain shower greeted us as we left the bungalow for dinner, and we enjoyed a Hinano beer as we watched the sun set for a second time on Friday, 11th August 2017. Watching the sun set for the final time on Friday, 11th August 2017 from Vanira Lodge. What was the longest travel day of your life?